For the second year in a row, Dohn receives an excellent Ohio Department of Education Report Card. 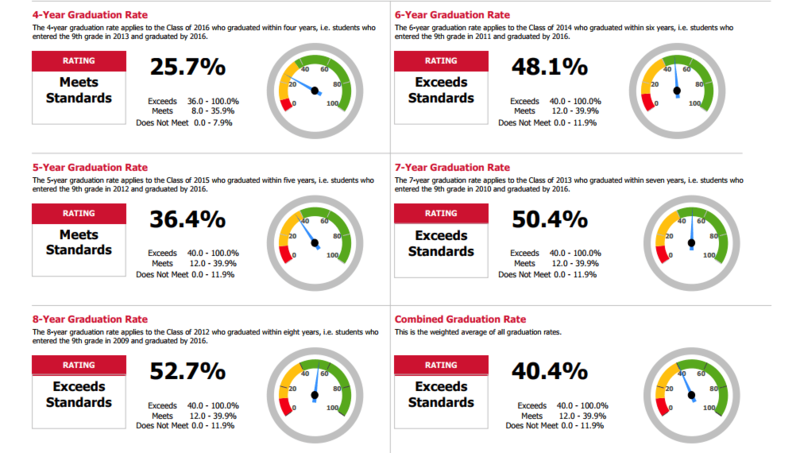 Our report card is in sharp contrast to the “F” grade many local schools have received this year. What is Dohn doing that other schools are not doing? Dohn’s door is wide open. There are no exclusion criteria. Any student who wants to come to Dohn is welcomed. Our Director, Ramone Davenport, sees what students need, and then delivers. As a credit recovery school, students come to us from schools that have failed them at an earlier point in their education. These other schools were unable to address academic or behavioral challenges so; the students come to Dohn because Dohn meets students where they are. What is Dohn doing that other schools are not doing? The difference at Dohn is that the administration, teachers, tutors, and staff take time with the student to see what is needed and then that need is met. If a student needs flexible scheduling due to a family or work commitment, we have a program for that. If a student is short a few credits, we have a credit recovery program. If the transient nature of a student’s life causes the student to miss school, our life coaches make home visits to find out why the student is not coming to class. Thirty percent of our current 683 high school students require an Individual Education Plan. We focus on getting the student up to the grade-level performance. We have tutors for them, and a learning environment that inspires improvement. Discipline challenges are addressed by teachers equipped to redirect and teach the student how to reframe, and self-contain. Dohn’s culture of inclusivity is quickly making us the school of first-choice for inner-city students. We are a credit recovery school, and enrollment of students who come to us at the start of freshman year is also growing. Building on our word-of-mouth success, Dohn teachers now see students eager to learn. Our counselors report an increased clarity in student identification of post-secondary pathways. We have multiple staff hard at work on developing the school-to-employment pipelines for our amazing, resilient, and creative youth. Yes, we received an excellent report card, when schools who serve populations similar to our demographic received falling report cards. Dohn knows how to deliver education to students with family histories generational joblessness, who live in areas of concentrated poverty, and who are chronically exposed to urban violence. Dohn is creating community among this population. Our students are the ones making the change. Dohn administration, teachers and staff bear witness to a student-directed inner-city educational revolution. Please join us! Explore volunteering at Dohn, call to learn more about our school’s exceptional work, or donate now. We are changing Cincinnati, and we invite you to work with us as we improve on educational opportunities in Cincinnati.